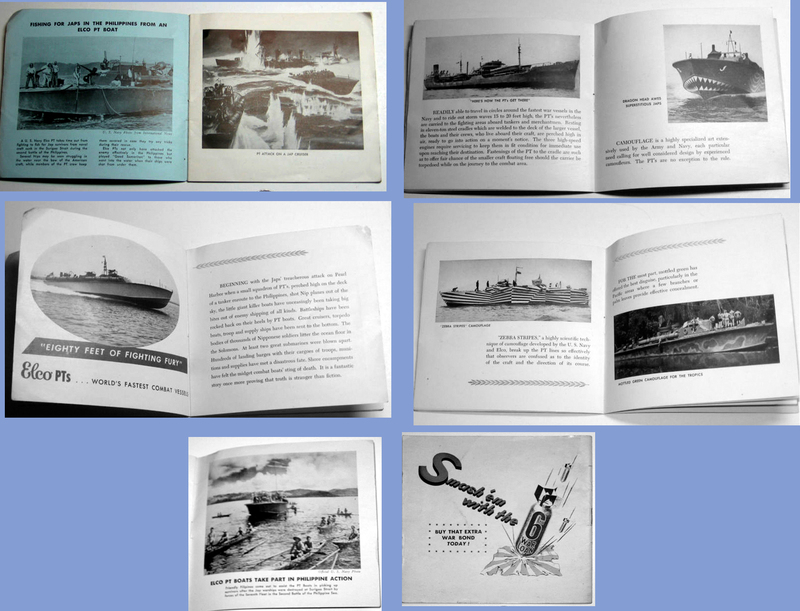 Jack Coggins's art was used on many marine magazine covers - shown below are some examples which I have located to date. Most of these I have in my collection - I would be very pleased to hear from any visitor with new information. To view the full size art please click on the thumbnail, image opens in a new window. 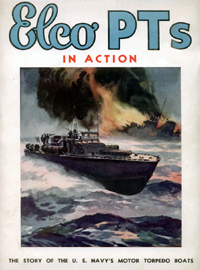 Volume 124, Number 4, April 1943. 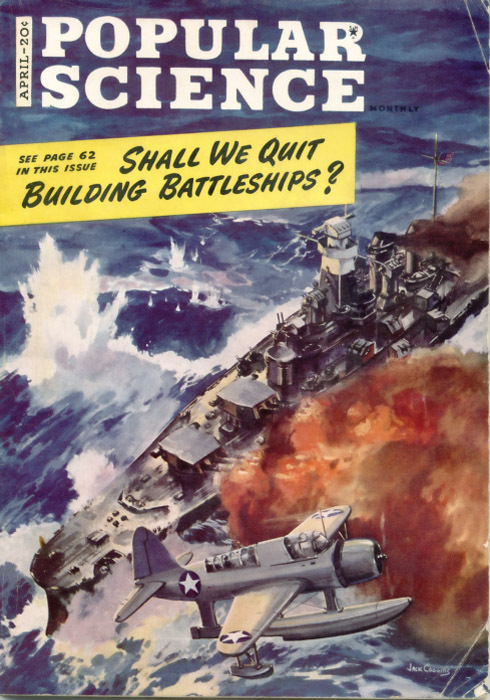 Title: Shall We Quit Building Battleships? Article by Alden P. Armagnac. Pages 62-72. 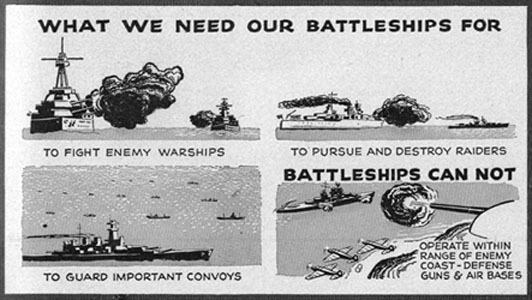 Why Do We Keep On Building Battleships? With planes challenging their supremacy, they still have work to do in a war at sea. 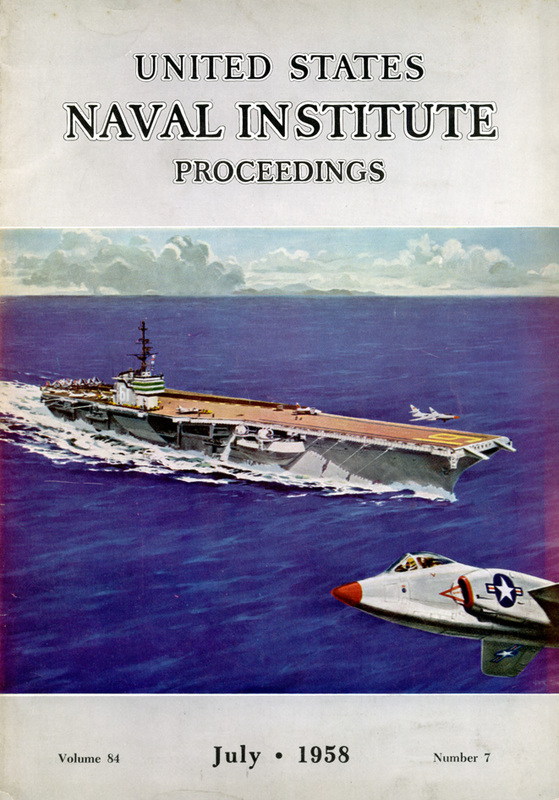 United States Naval Institute Proceedings. 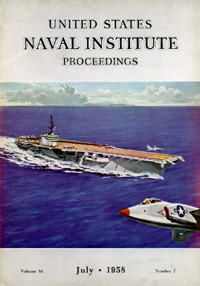 Volume 84, Number 1 - January 1958.
probably the finest ship of its type that has ever been built. 45 feet beam, and 19 1/2 feet depth. ship of the class is scheduled for completion mid-1959. 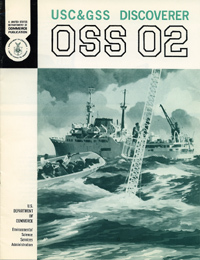 Volume 84, Number 7 - July 1958.
when he visited her during her shakedown cruise off Cuba late last year. Volume 105, Number 2 - February 1979. 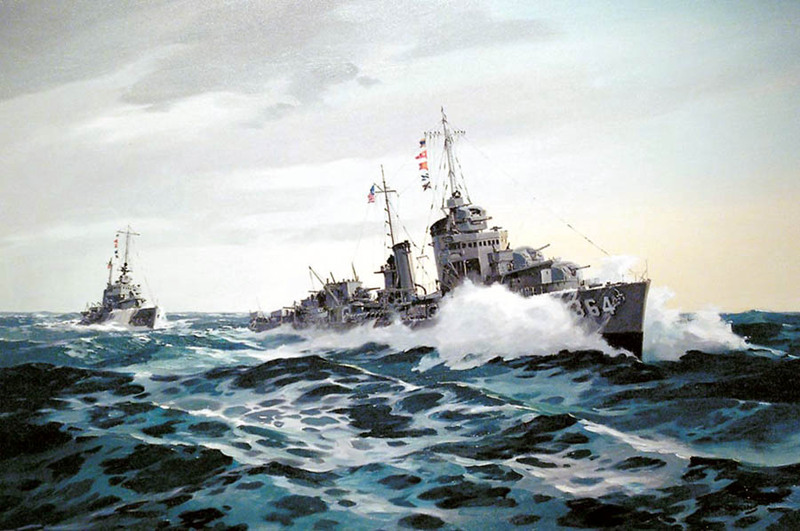 In this painting by Jack Coggins, the South Dakota (BB-57) heads a column which includes other ships of her class (see page 57). 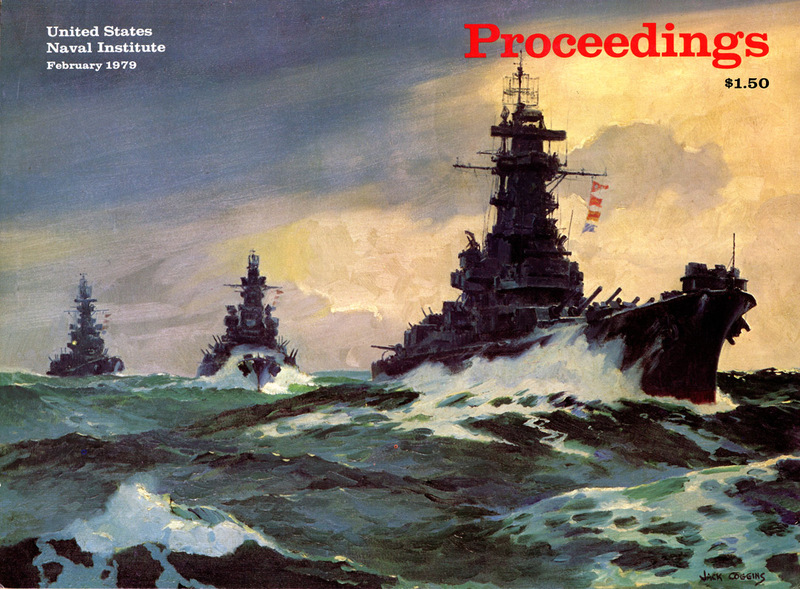 Commander Edward J. Matthews was on board the "Sodak" when she and two sisters bombarded the island of Honshu in 1945 (see page 74). The original painting is in oil, 24" x 34" and is titled "In Column (USS South Dakota, Massachusetts, Alabama)". The painting was completed in 1973 and sold in 1985 for $2450. 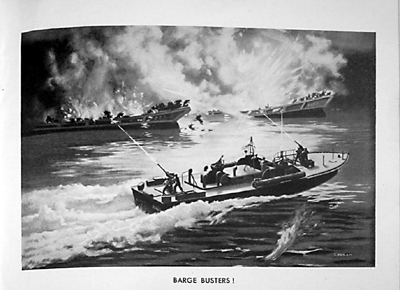 Prints, titled "Battleline, Pacific" and sized at 15" x 20", were published by the U.S. 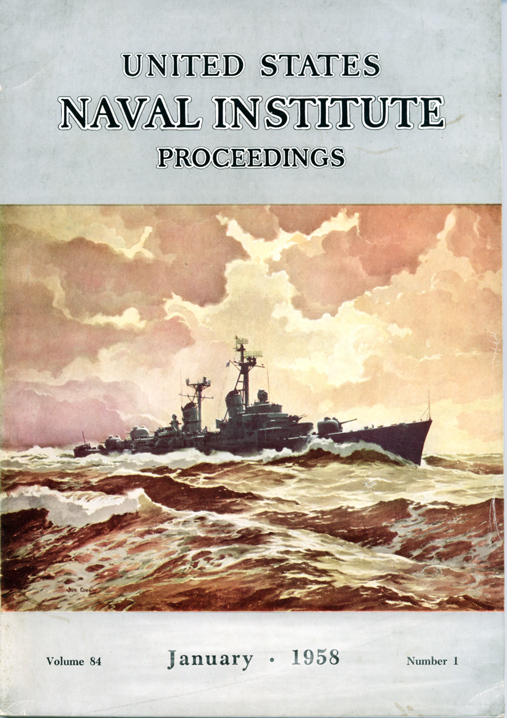 Naval Institute - date of publication and quantity is not known. 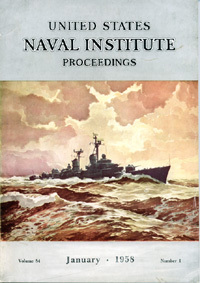 Naval War College Review. Volume 55, Number 4 - Autumn 2002. Click on the thumbnail for a large image of the artwork. The painting on the cover of this magazine was originally offered for sale at a 1989 exhibition at the Mystic Maritime Gallery. 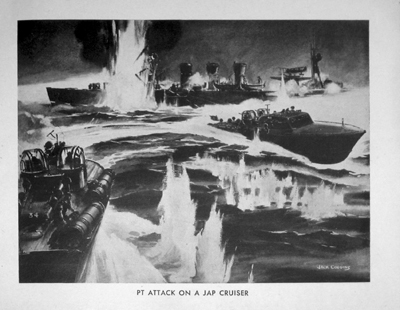 During the exhibition, the gallery contacted Jack and said that they had a sale for the painting (priced at $2500) on one condition; the buyer was a retired Navy man who captained a Mahan Class Destroyer number 364, and wanted his ship's number on the painting, rather than number 365 as Jack originally painted. Jack complied, and the sale was made. The pictured Mahan, second of that name and the first of its class, was commissioned in 1936 and participated in the Pacific War from 1941 until its sinking on 7 December 1944 after an attack by a kamikaze aircraft off Leyte. The painting was given by the USS Mahan association to the Naval War College Foundation, which made it available to the museum for exhibit. The Mahan-class destroyers served in the United States Navy during World War II and the USS Mahan (DD-364) was the lead ship of her class. She was named for Rear Admiral Alfred Thayer Mahan;launched 15 October 1935 and commissioned 18 September 1936, Commander J. B. Waller in command. Displacement 1,450 tons, Length 341.4 ft, Beam 34.8 ft, Draught 17 ft, Speed 35 knots. 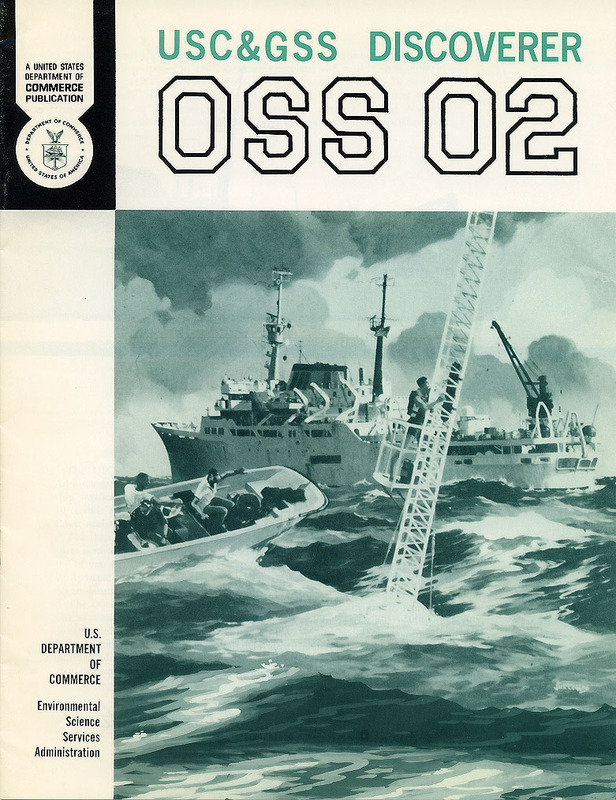 USC & GSS DISCOVERER OSS 02. This 16 page magazine was published by the United States Department of Commerce in 1970. The Discoverer was one of two new oceanographic survey vessels at the time, and was commissioned to survey the depths of the ocean along the US Atlantic coast. 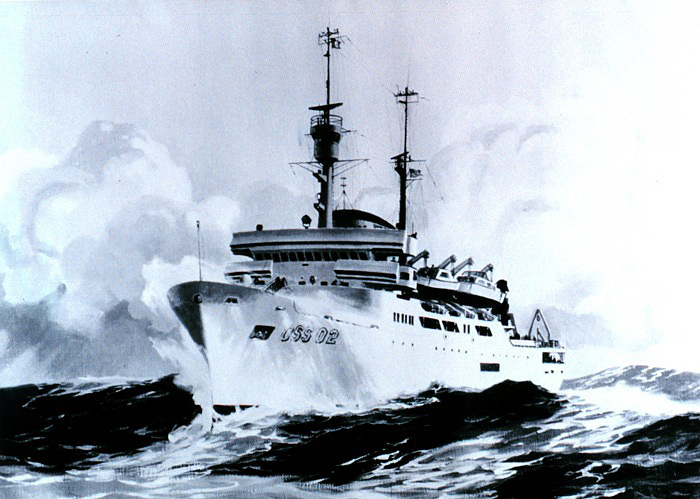 In 1968, Jack Coggins was invited to undertake part of a voyage from Barbados on the Discoverer (one report here) and commissioned to paint several images of the vessel and crew. Harris B. Stewart was the author of that report, and the chief scientist who commissioned and personally paid for the artwork. The result was four large oil paintings, and several watercolours and sepia sketches. 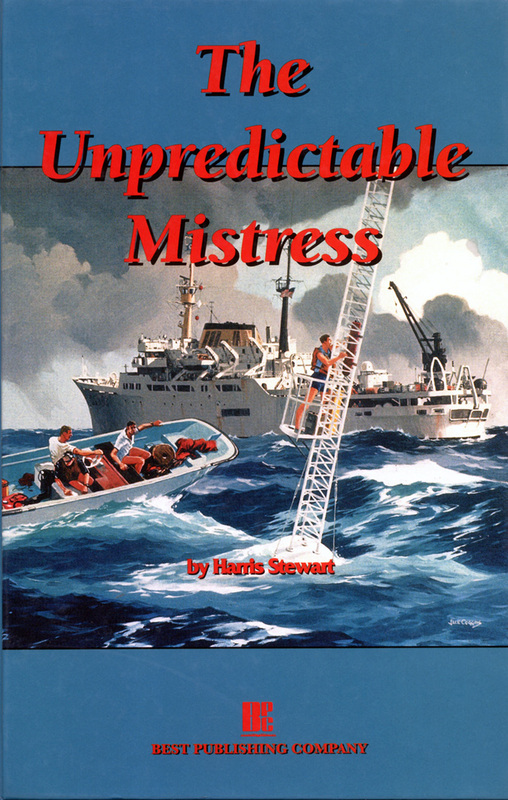 The image on the front of the magazine is one of the resulting oil paintings, which was also used on the cover of Stewart's book "The Unpredictable Mistress". This painting is another I have located. The paintings hung on the walls of the NOAA Laboratory in Miami for many years. On Stewart's retirement from NOAA he took the paintings - he passed away in the year 2000, and the whereabouts of the paintings is currently unknown. 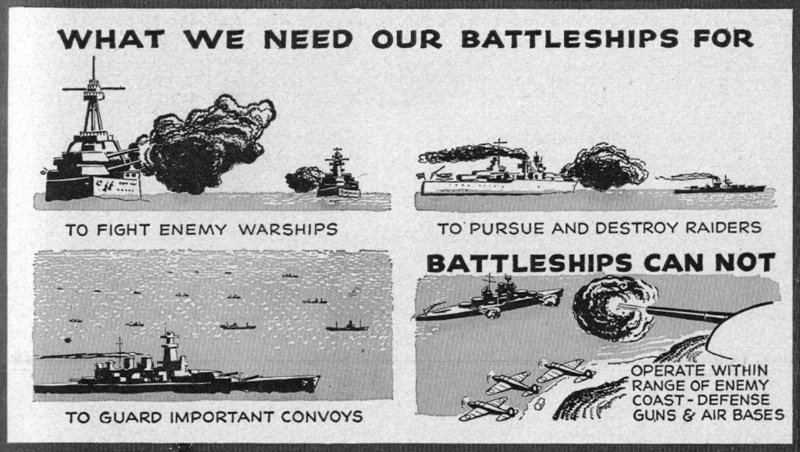 Elco PTs in Action: The Story of the U.S. Navy's Motor Torpedo Boats. Published ca. 1945 by Electric Boat Co. This magazine has 64 pages of stories, history, photographs and advertisements by the companies that manufactured and supplied components to the boats. 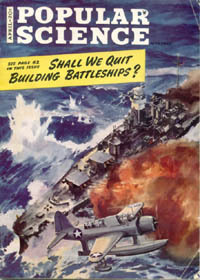 Articles include "The Development of the PT," "Squadron X - Their's Was the Job of Patrolling Between Guadalcanal and Tulagi and They Did It Well," "The PT's Box Score," "The PT's Air Arm," "North of Latitude 49o," "PTs in the Pacific," "The Story Behind the Expendables," "Where They Learn to Be Tough," "Milestones in Elco History," among others. Each article is accompanied by photographs. The cover illustration and articles are reprinted from Yachting Magazine. 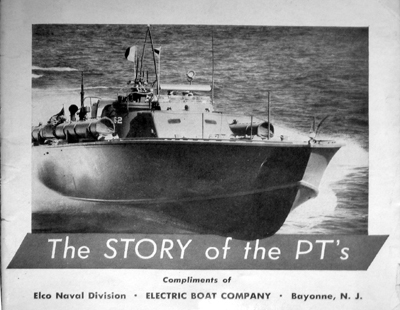 About 1944 a little promotional booklet was published by Elco Naval Division, Electric Boat Company of Bayonne, New Jersey, called "The Story of the PT's". It was about 5 1/2" x 5" with 28 pages, containing over 19 photos and illustrations. It contains a copy of one of Jack's illustrations from an ELCO advertisement - "Midnight off Sebu". A copy was recently sold - unfortunately I was unable to secure it, but the seller very kindly sent images for me to use. There is a second image in the book which, on first glance, appears to be also Jack's work - it looks identical to Jack's style. However, it is signed "LEASON" who turns out to be the Australian artist Percy Leason. Below is an image of the cover, Jack Coggins' illustration, and Percy Leason's illustration. Note the similarity - there is a very interesting reason for the similarity of style, which is discussed below. Click here to see more pages from the book. Percy Leason was born in country Victoria, Australia, in 1889. 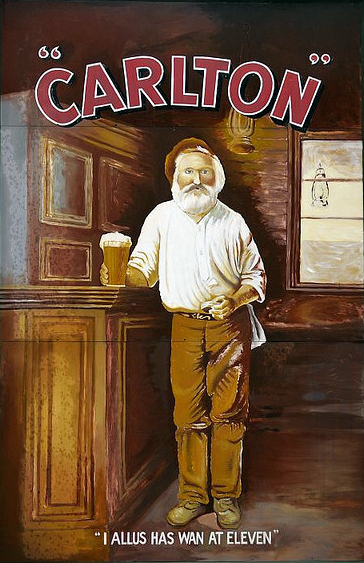 He was apprenticed as a lithographer and studied at the National Gallery of Victoria Art School. He became an artist and illustrator, producing etchings, cartoons and other commercial art. One of his early illustrations became a famous trademark "I Allus has Wan at Eleven" which came from the old poem "I always have one at eleven; it's something that I've always done; 'cause if I don't have one at eleven; then I have eleven at one!". Although Leason was making a good income from his work, he became a controversial figure in the local art world, and he decided that New York would be more suitable for his talents. He moved his family of six children there in 1939. Leason commenced working and teaching in New York, and was associated with the same group of artists as Jack Coggins at the time - he may well have taught or at least influenced the young Jack. One of Leason's special interests was tonal analysis and its depction in art, and the similarity of tonal depiction in Jack's and Percy Leasons's work above shows that he had a great influence on the former's style. Jack's early works were rather one dimensional and a definite change can be noted during the early 1940s.